Today was a missions visit day (after our African adventure journey to the rhino reserve yesterday). Scott and I visited several churches in and around Gaborone today. 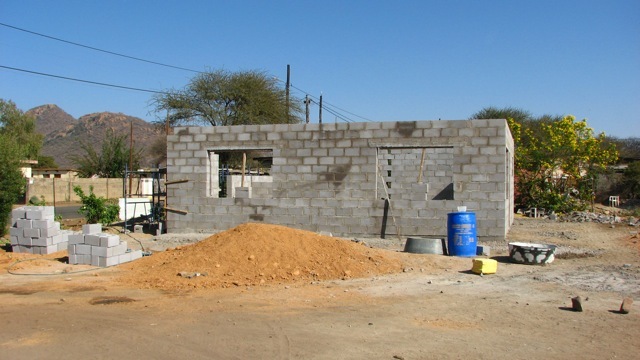 First, we meet with Moruti James at Naledi and got an update on the construction. 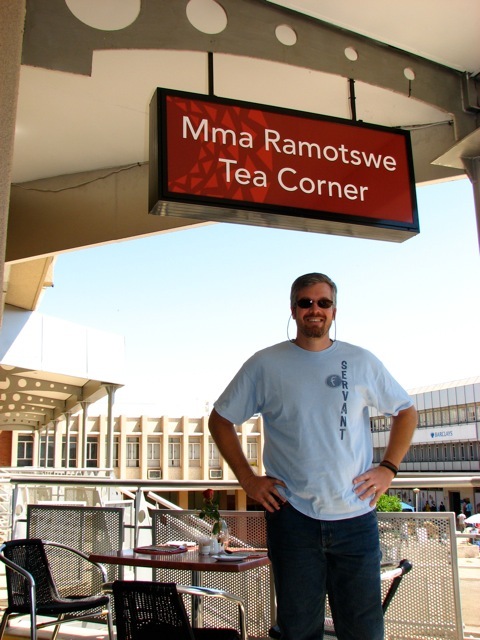 We then went downtown for some quick shopping (got a Botswana flag guitar strap) and had tea at the President’s Hotel. Scott also took me to the Three Dikgosi Monument in downtown Gabs. 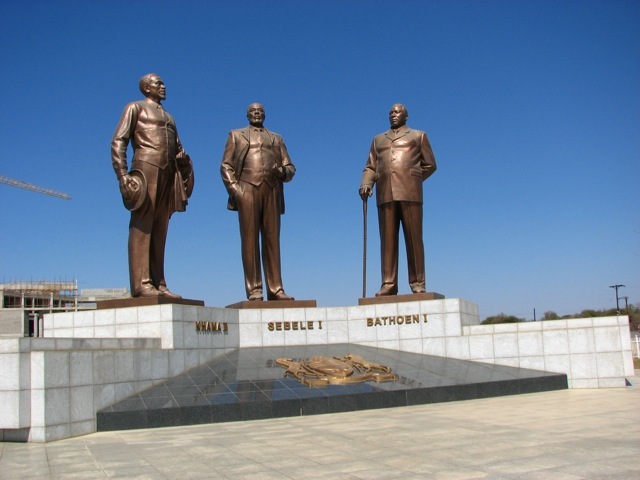 It’s a monument to the country’s foundation and history with statues of the 3 founders. I think this should be required for all vistors! We then had a great meeting with Moruti Norman at Open Baptist discussing missions. Finally, it was time to head out of town. We headed out to Molepole (moley-po-low-lee) township north of town. Moruti David has a church there that meets in a former shebeen (bar). We also picked up a cowbell from a street vendor for Nancy. Outside of Molepole, we found the Livingstone cave. 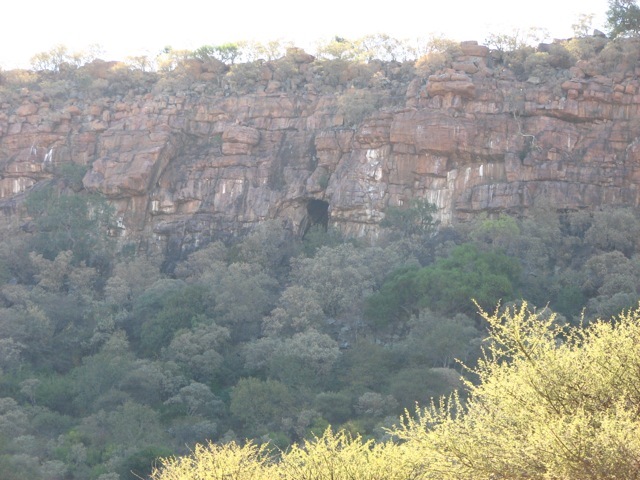 David Livingstone spent the night in the cave in order to lead the former chief of the local tribes to Jesus by proving that God would protect him from the evil spirits that supposedly haunted this cave. That was cool, also saw a troop of baboons out there too. 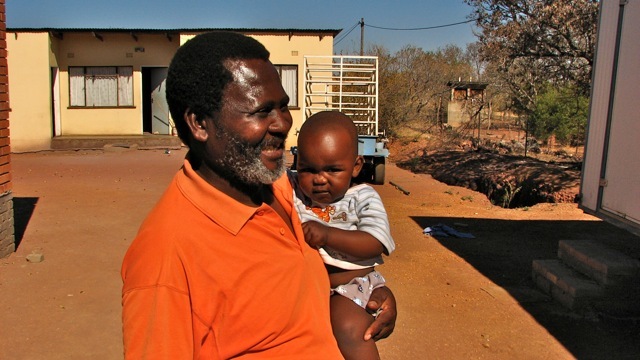 We went back to Gaborone through the village of Kumakwane (the village where David Livingstone lived when in Botswana). Some of the Open Baptist leaders live in this village today. We tried to find Gakuto (ha-ku-toe) village today; but, the new construction on the highway had us confused so we continued on to Molepole. I ended my last full day in Botswana with the prayer meeting at Naledi Baptist. I brought the Word again focusing on Ephesians 2:19-22 reminding the group that we are all family in God’s eyes and that we must base everything we do on Jesus as the cornerstone. I used the construction projects as my example and stressed that a building does not make a church. Again, we had great worship and singing to start the service. I slapped the tambourine to the tunes in Tswana since I didn’t know the words. I will miss their singing and voices lifted to God. After the prayer service, Moruti James announced he had a special surprise for me. He asked me to move my chair to the center of the circle. He said that there is a Botswana saying that he who remains last is the chief. 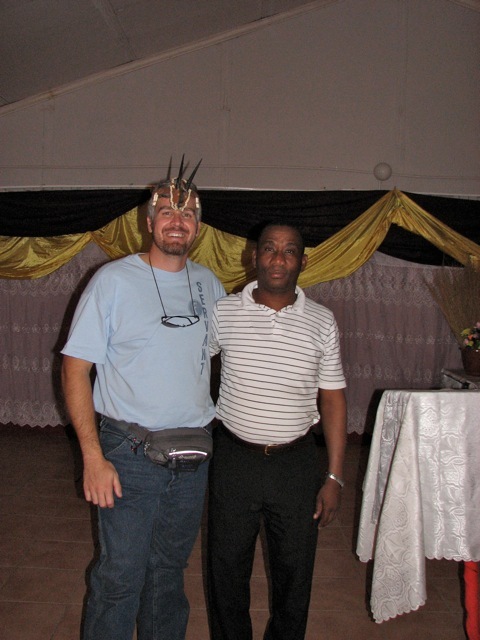 He then pulled out a handmade crown (goat skin and horns with ostrich egg shell) that he placed on my head. We all hugged and we wished each other well until we meet again. It’s no longer a sad goodbye and more of a “kayta labona” (“Until I see you again.”). We again had the 2 college kids from Campus Crusades as dinner guests and Tonya topped it off with a special chocolate cake for the chief 🙂 Nice to have such awesome hosts here in Botswana. 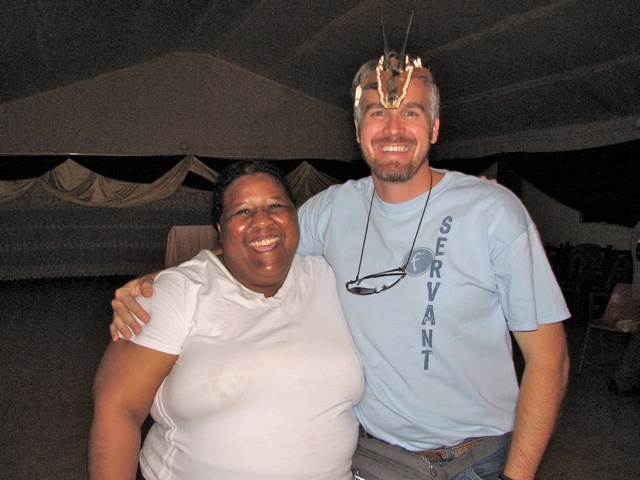 Please continue to pray for the Shipes as they start the real work next week. Their orientation phase is coming to an end and now the ministry will be kicking into high gear. 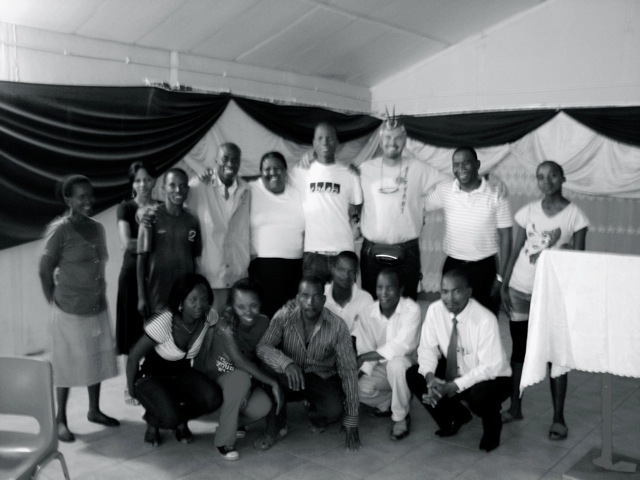 I see mighty things from this family doing God’s work here in Botswana and all of Southern Africa. I look forward to returning to spend more time with the Shipes soon. Tomorrow afternoon is the journey home. I am having lunch with Jeff and April Sukup (missionaries from Tampa, Florida) and hope to get a chance to meet with the Flying Missions team too. This ends the active part of this blog. So, thanks for keeping up with our work here and for your prayers and encouragement during the planning and travel. We couldn’t do it without your prayers and support. Please check back later as I plan to add updates on the feeding station construction project and add a link to a photo gallery of all the pictures. This entry was posted in Botswana, Gaborone. Bookmark the permalink. Thank you, Mark for such interesting and compelling posts. We all appreciate you so much. Travel well back to the USA.